Over the last month or so, I’ve had the pleasure to work with one of my good friends on her daughters’ bedroom makeover. 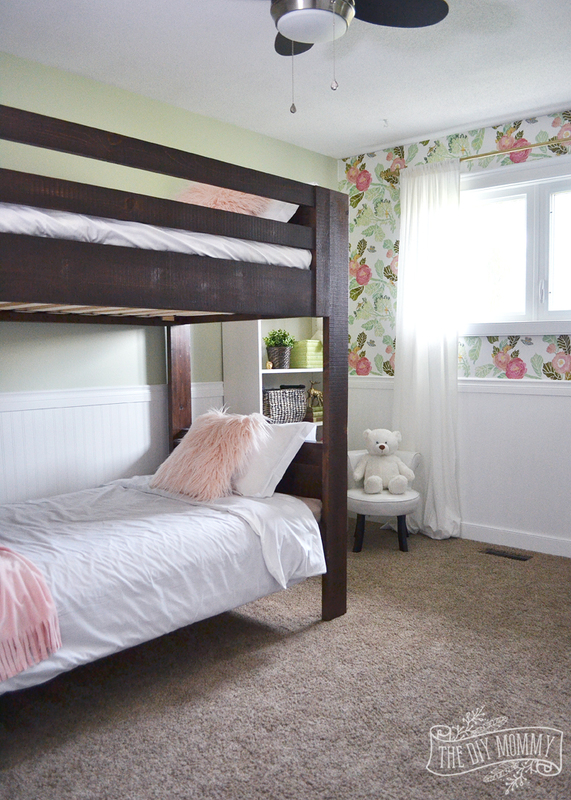 This little room for Zoe and Ruby has been quite the endeavor – my friend Alyssa and her husband Justin have worked really hard to make this bedroom design become a reality for their daughters, and the outcome is absolutely breathtaking. I’m so excited to be able to show you the final space today! Let me share with you this gorgeous rustic glam styled bedroom design for two girls with lots of easy & fun DIY ideas. This room turned out even sweeter than I imagined it would. In case you missed it, here is the original mood board for this project that helped us plan out the colours and feel for this bedroom design. 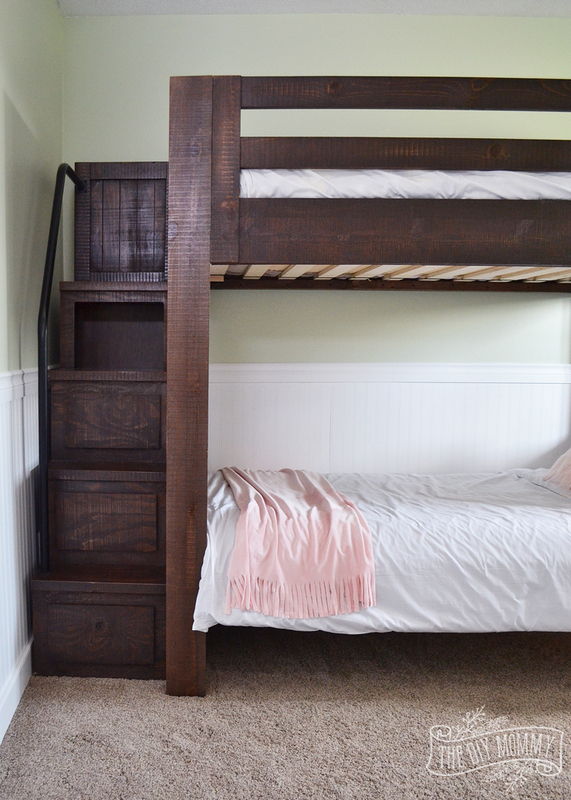 Upon entering this room, you’re greeted by this beautiful, rustic solid wood bunk bed from The Brick. What makes the Phoenix bunk bed unique is the fun set of stairs on the end with all of the little storage cubbies. I’m also smitten with the colour of this bed; the dark wood gives this room its rustic vibe. Simple white linens on the bed keep the space fresh & airy. 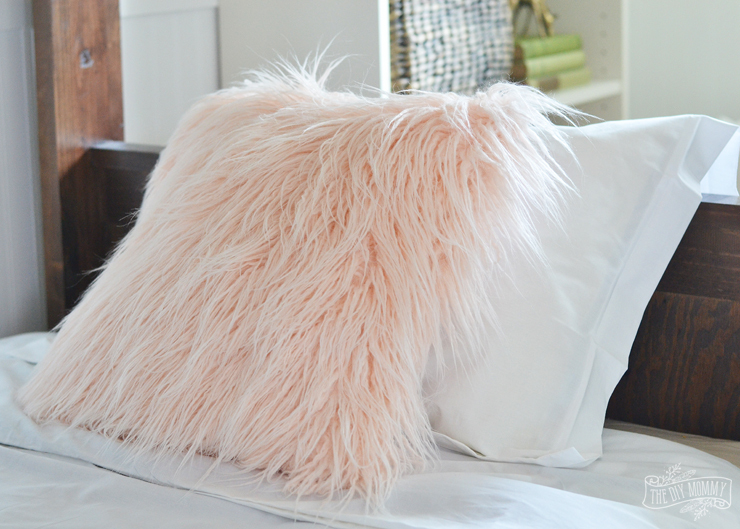 I made a couple of these ultra fluffy faux fur pillows in a blush pink shag fabric, and you can find my tutorial for making fur pillows right here. Ruby and Zoe’s room already had this gorgeous wainscoting, but we painted the upper part of the wall in a soft green, and applied a wallpaper treatment to the window wall that gives this room a beautiful focal point. 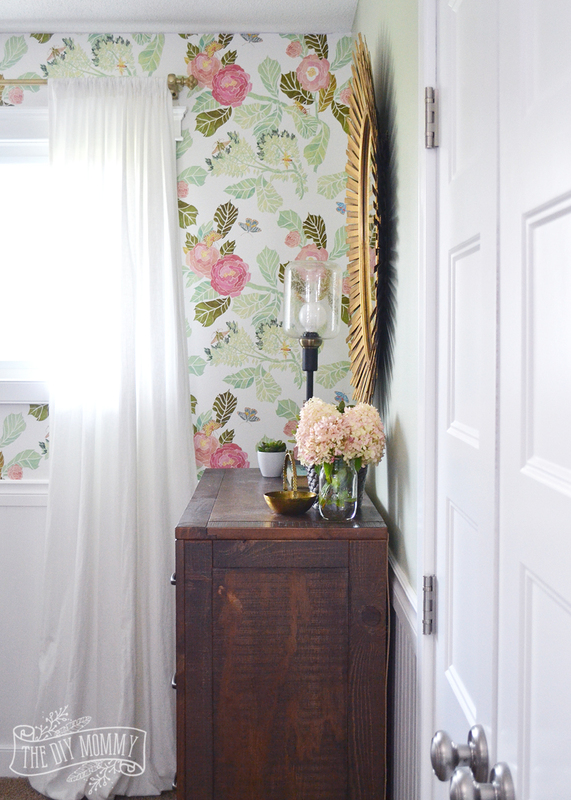 You can check out my video tutorial for hanging wallpaper right here. In the corner by the bunk bed, we created a sweet little reading nook with a bookshelf and the Monarch Children’s Accent Chair from The Brick. This wee chair is small enough that it doesn’t take too much space in this small bedroom, but it’s still big enough for little ones to sit and read or sit and put their socks on. Plus, it makes a fab chair for Teddy! 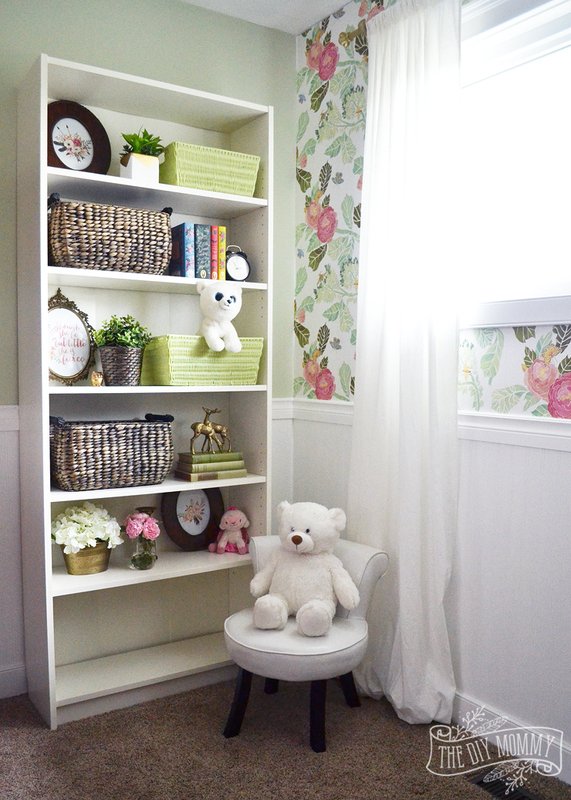 The bookcase is styled with lots of baskets for toys. (Sigh. 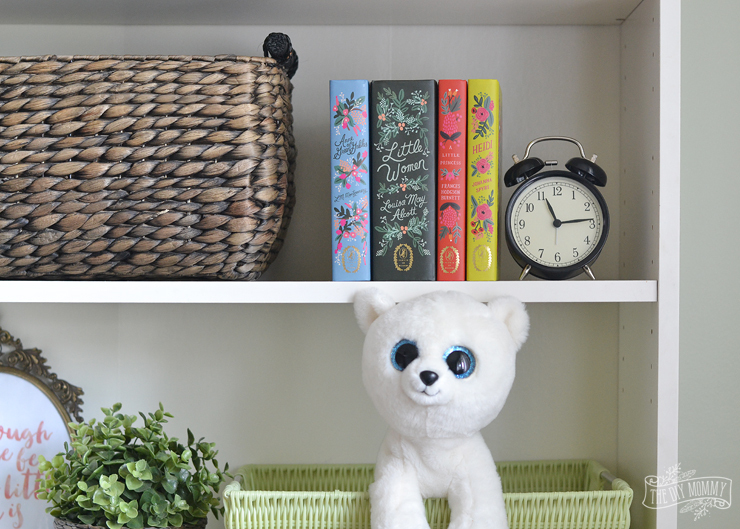 If only our kids’ shelves could stay this organized looking 24/7, am I right?! We can dream, mamas.) 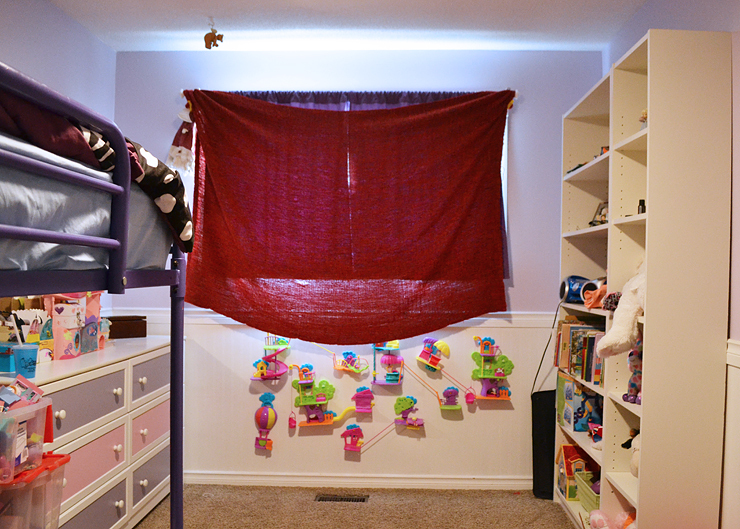 I LOVE shelves and baskets for kid room organization – they’re a great way to hide little toys and collectibles! 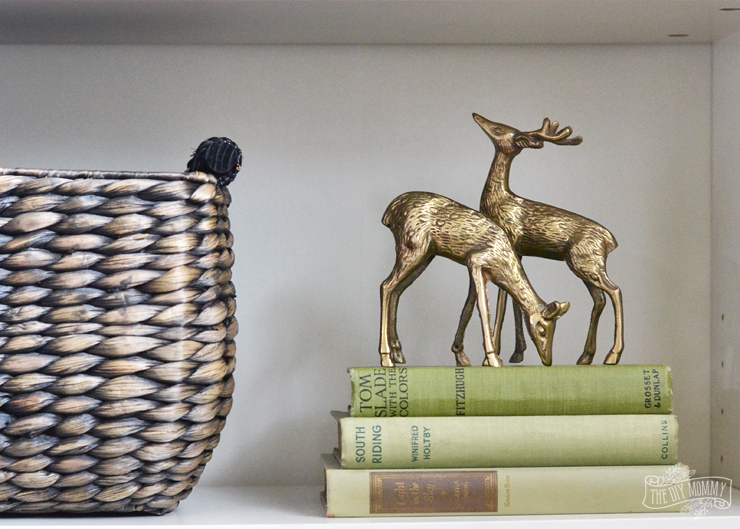 We personalized and stylized the shelves with some artwork in antique brass frames that Alyssa found. I love how the antique pieces like the frames and the little brass ornaments add some history to this space. 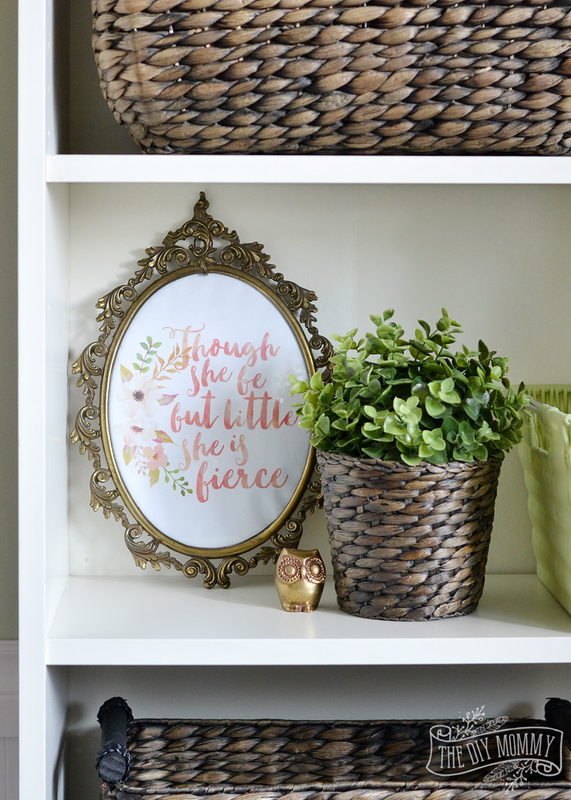 You can download this “Though she be but little she is fierce” floral artwork for free right here. This final corner of the room has got to be my favourite. 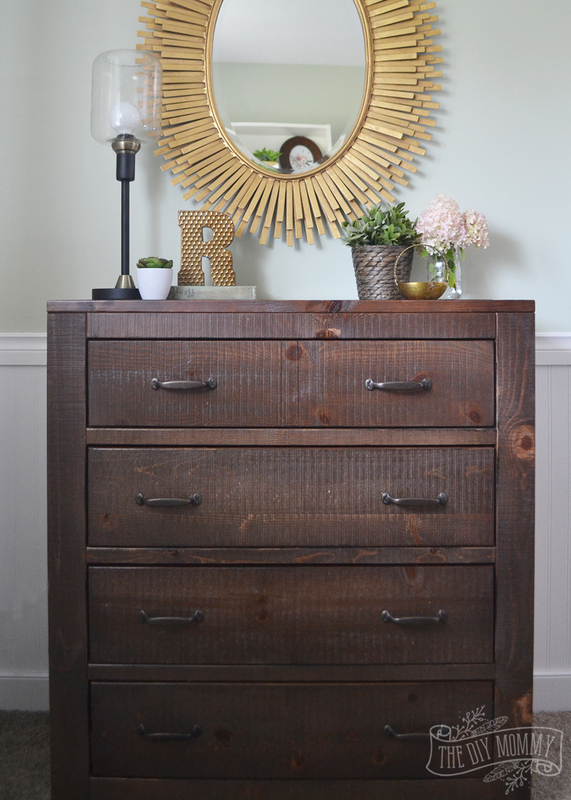 There’s just something about rustic wood plus gold and floral that’s so beautiful! 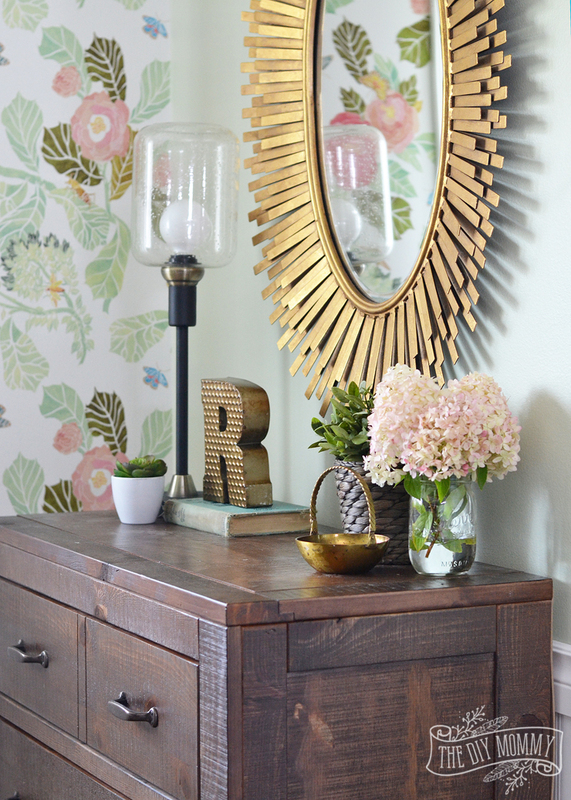 I love the contrast of the feminine floral wallpaper with the dark walnut coloured wood of this dresser here. This chest is the Phoenix Chest from The Brick and it matches the bunk bed beautifully. It’s so solid and well-made, and it provides some great clothing storage for the girls. 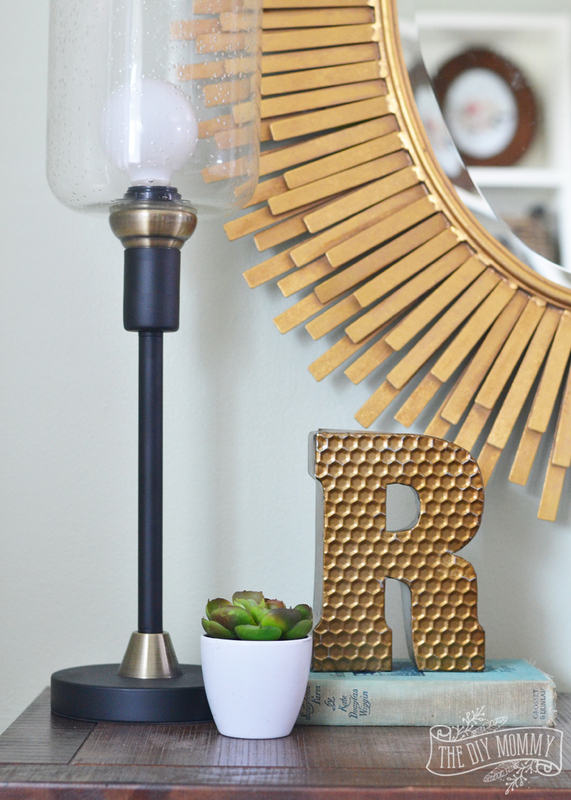 And can we stop and talk about this stunning gold mirror and vintage styled lamp?! This golden mirror is a showstopper. It’s the Sparta Mirror from The Brick, and it gives this bedroom a huge glam factor. The Lighting Bug Table Lamp from The Brick keeps the room looking rustic, and ties in to all of the other vintage accessories in here like the old books and antique brass accessories. Alyssa and Justin worked really hard on installing and painting new trim and doors in this room (and they’re installing the in the rest of their house too!) which gives Ruby and Zoe’s room the final finishing touch. 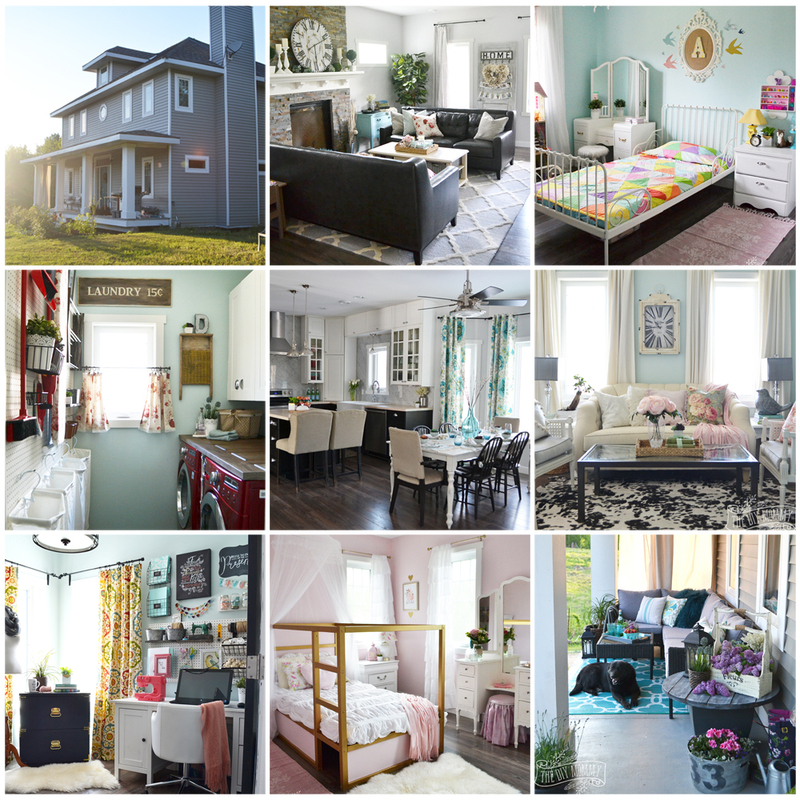 The best part of this room makeover was when I heard how happy the girls were with their room. 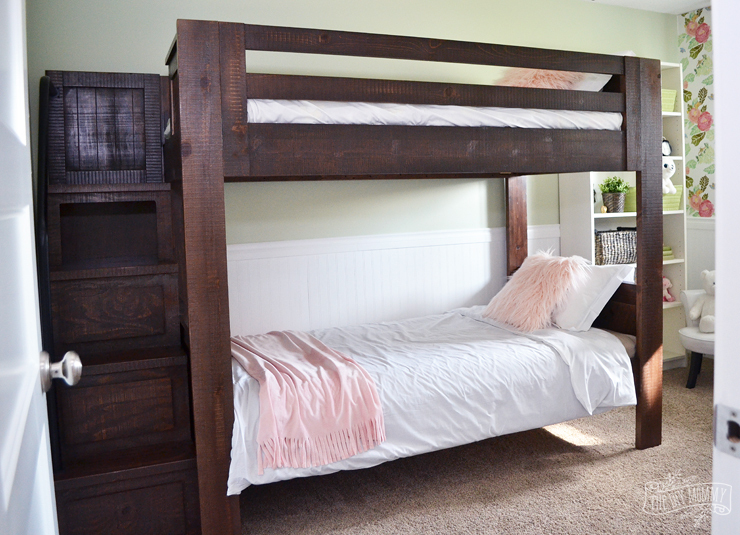 There’s nothing better than hearing that my little clients loved their bedroom and felt cozy and special in it! 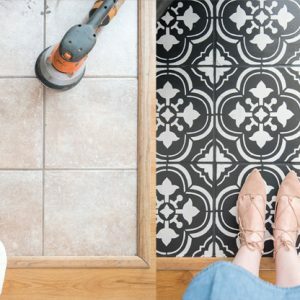 Hooray for lots of DIY, a couple of beautiful new pieces of furniture from The Brick, and a fab mix of vintage and new accessories! Sweet dreams, girls. Disclaimer: This post is sponsored by The Brick. As always, all of the ideas and opinions here are my own. I only recommend companies that I use and love myself. WOW!!! What a transformation! LOVE the mix of rustic and glam!!! It turned out SO beautifully Christina! Thanks so much, Kristi! I love this space. Gorgeous transformation. 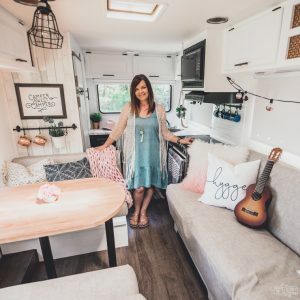 Where did you find the bunkbed? Also, the floral wall paper is perfect for that room. Swooning. Thanks so much, Jen! 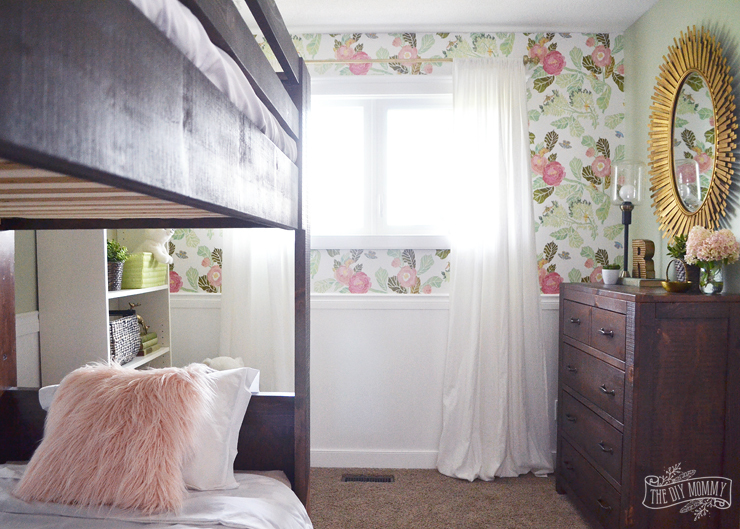 The bunk bed is from The Brick and I’m totally in love with the wallpaper too! This is beautiful! I love the mix of soft colors with the dark wood bed, all so gorgeous! 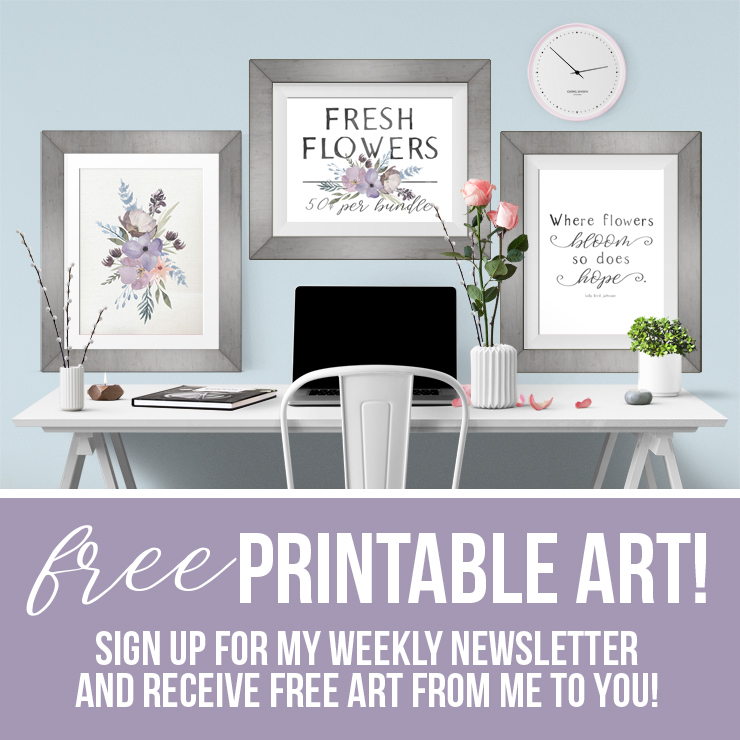 Hi there, I haven’t been a reader for very long and I know I followed a link from one of my regular blogs to find yours. Your designs are lovely. However, and this is a truly honest question and not meant to be rude but is this blog run from a corporate section of the furniture store The Brick? Or are your posts mostly sponsored by that store? Its just that so many of your posts mention items from there and I’m unsure if I am reading a personal lifestyle blog or reading a corporate ad campaign. Again, a truly honest question and I do enjoy the designs but am not sure if there is a corporate design team behind them. Hi, Gill! Thanks so much for reading my blog. I’ve signed on to a sponsorship contract with The Brick for a certain term, but all of the ideas, words and designs here are still my own. 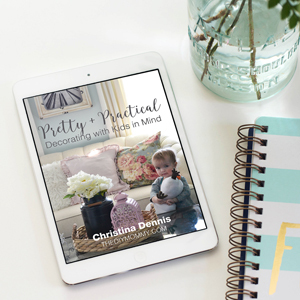 There is no corporate design team behind my blog posts – I have 100% creative control and I’m able to do bigger and better DIYs and room designs because of this sponsorship. Hope that makes sense! Wow, the bedroom looks amazing! I love how you made the rustic style work mixed with the pastel colors. This is definitely the look I’m going for my daughter’s bedroom. Love it! Hello. Can you tell me where you got the gold mirror from? So sweet! Love everything. Lucky girls and wonderful parents. Thanks for sharing! My one concern is the shelving unit. I hope that someone anchored it to the wall. In this picture it’s top heavy and sitting on carpet. Too easy to pull over if reaching for items on the top shelves. Other than that it’s a very pretty room. It’s beautiful, but how are the girls doing with the white linens and keeping them clean? Lovely girls bedroom. Wonderful transformation. I know tge girl love spending time there. Merry Christmas and a Happy New Year.